A successful year with all the best! 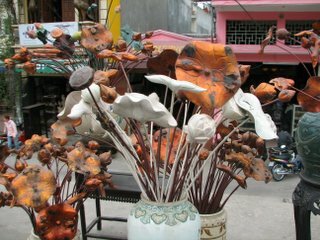 Some time this year, buy some lotuses, real or artificial. 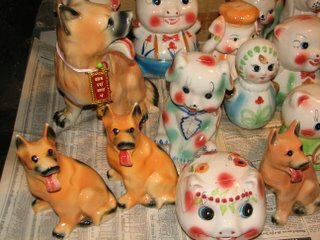 Or put money in these vases and put them under your bed. Vietnam Airlines’ service for domestic flights is unbelievably bad at the check-in counter. 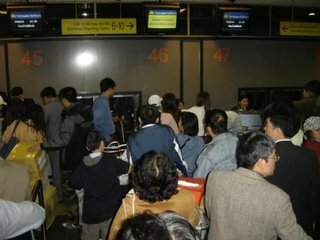 I couldn’t believe that I had to stand in the queue for more than an hour, only to be informed that the plane had already taken off even though the staff already knew the plane was full, and there are lots of people still waiting for that flight. The problem is that there are heaps of staff wandering around but they don’t really know what they have to do. Many passengers realized that the staff were putting too many passengers on our plane which meant our seats were not available. Nguyen Manh Hung the supervisor argued with passengers and he said it was so strange to be in this situation. We all said what is strange here? We all had tickets and had been standing there for over an hour, and if the plane was full, the staff should have told us officially, but they didn’t do that. The way they explained it to us was that it was not their responsibility. What kind of service is that? I have been traveling with different air lines and Viet Nam airlines always make me feel insecure. It seems that this is the treatment for cheap promotional airfares and for normal air fares as well. Anyway, we had to take another later flight and that flight was delay for another two hours because of they had to wait for the connecting flight from Korea and it means we will arrived Ho Chi Minh City at 1.30am. I was so upset with this kind of situation even though, we all know passengers should be well treated because flying is expensive and in this situation, we were treated very poorly. I would think that, because this is the national airline that they would be more proud of the service. It’s no wonder that they always appear on the bottom of the survey of airlines. This is a shame for the national airlines which is supposed to represent the Vietnamese culture to the world. This problem needs to be solved. I'm going down to Ho Chi Minh City and Nha Trang for a short vacation for Lunar New Year, but I still try to post as much as possible. Thanks for supporting me in the past year, and hope you guys keep coming back for more. Wishing you guys a New Year filled with new hope, new joy, new beginnings, happiness and prosperity. Peeling young mango skin, then slice finely, soak in salty water( not lots of salt) for a while. The spring onions and celery need to be chopped into 4cm lengths and the carrots sliced finely. Add the dressing and only 5 minutes before serving the dish. I think in Asia or even in western countries, end of year parties are a cultural tradition. 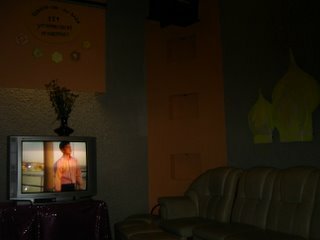 In Vietnam, we have lots of parties for this occasion for a few special different reasons. 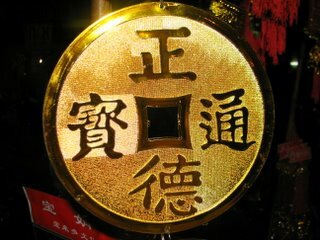 The first reason is to say good bye to the old year and welcome the new year with cheers and beers to a successful year. The second reason is to meet up with friends and colleagues. The third reason, which the government is actually trying to stop, is the exchange of presents from the staff to the management, which is a common form of corruption. 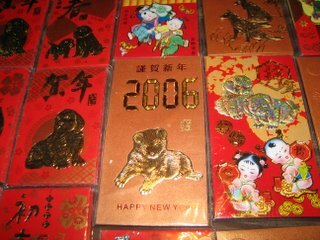 Almost every company celebrates at a restaurant, Bia Hoi or at hot pot places, karaoke or at Dog restaurants. 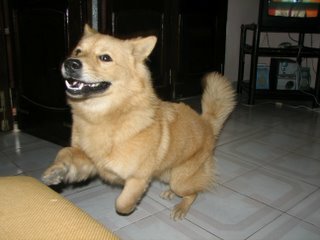 You might think that it's so weird to celebrate an end of year party at a Dog restaurant, but in Viet Nam, eating Dog meat at the end of the year is a way of ridding bad luck away from you and welcoming the best to come to you. We bought some live prawns and I mixed them with some salt, sugar, fish sauce, chili, and lemongrass and soaked them for about 10 minutes. After that, I stir fried them on high in the wok until all the liquid was gone and they were a bit dark (that's the color from the sugar) which means they were done. They should be a little bit sweet, a little salty and I think you should squeeze some lemon on the prawns to make it even better. 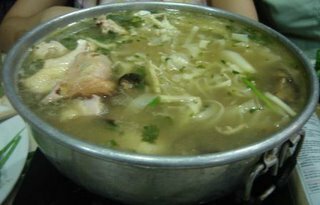 This is a common dish which most Vietnamese can do well. 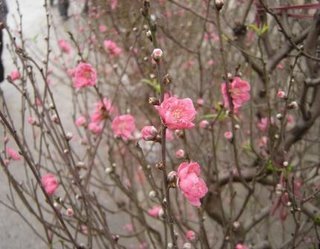 The Tet flower season has opened, flowers are appearing everywhere on the street. For bargains, the best place is Nhat Tan. There are thousands of flowers that will amaze you, there are so many types that you may never have seen in your life. Lots of orchids from China, so many Mai (Morning flowers), Đào (cherry blossoms), roses and so many more. Come to this place and you will feel like you are in a valley full of colourful flowers. 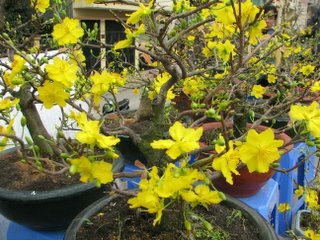 Nhat Tan is one of the most famous places in Viet Nam for flowers, where there are special and rare flowers that other places don't have. This place is impressive not only because of the colour and amazing flowers, but also because of the friendly people who sell and explain about the flowers, where they come from and how to take care of them. 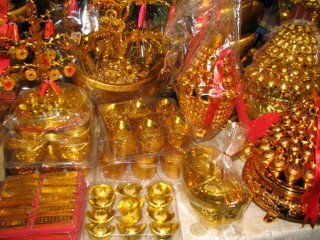 In addition to all the flowers at this time of the year, there is lots of stuff on sale for Tet (Vietnamese new year). Lots of different kinds of pots, statues of Buddha and all kinds of trees, including cumquats. Most chicken noodle soup shops changed their businesses to beef noodle soup due to the bird flu problem, though in the last week chicken has re-appeared at some places. Making a bowl of noodle soup doesn't seem difficult when you look at the shopkeepers doing it, but the process before it is served is long. The most difficult part of this dish is making the stock. The right ingredients must be chosen and cooked for a long time and then you can enjoy a superb bowl of soup which will make you smile. I am going to give you the recipe for beef noodle soup from Wild Rice, my workplace. Fresh Rice Noddle: 100g Soup. 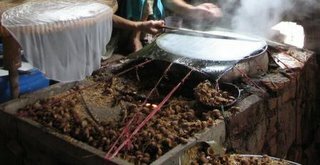 How to make: To make the broth with the special taste of Hanoi “Pho”, firstly you have to grill almonds, cinnamon, anise and fresh ginger for about 2 minutes then add it to beef broth (water and beef or pork bones) and bring it to the boil, then simmer for a few hours. The beef sirloin is boiled in the stock, too, until it is done. Before putting fresh rice noodles into a bowl, you have to dunk them in fresh boiling water slightly stir them up for a few seconds to separate them, then strain. To serve: Put prepared fresh rice noodle in to a large bowl, put thinly sliced beef on top, followed by some spring onions & herbs, pour over the hot beef broth. 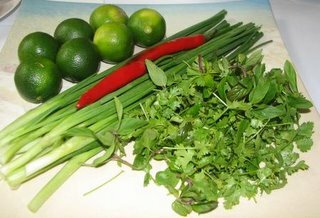 For Vietnamese tastes, we normally add some vinegar, lime and chili sauce when having “Pho Bo”. A different dish, a different taste and if you want to experience this dish at Wild Rice, please order it in advance. 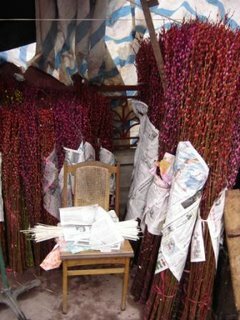 Otherwise, it can be had at hundreds of stalls all over the city. 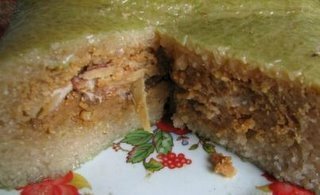 Sliced shoulder cut pork meat, green bean paste and pepper are mixed up in the middle of this Khuc cake. The outside is a mixture of bean and, of course, sticky rice. The process is pretty simple: make some sticky rice, form a ball with the pork and beans mix and shape the stickyrice around the ball. 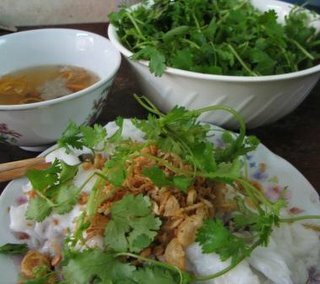 This dish is very famous in the Dong Xuan market area in Hanoi and the best time to eat it is winter. 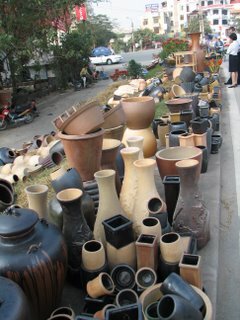 It is sold near the end of Hang Duong Street with a very simple sign. They sit right on the pavement with a huge pot full of Khuc cake sticky rice. 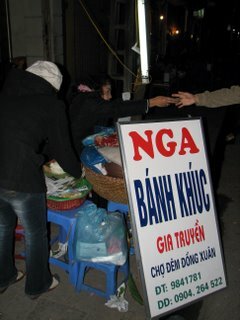 At only 4000Vnd/serve, that's your dinner, delicious and cheap. 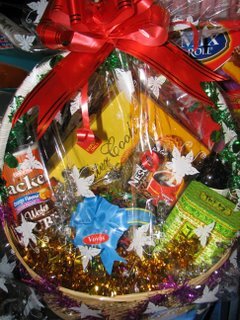 You can even order via telephone or mobile as well for free delivery and they also cater for parties at special rates. Try it out! There are lots of different kinds of steamed rice pan cakes. 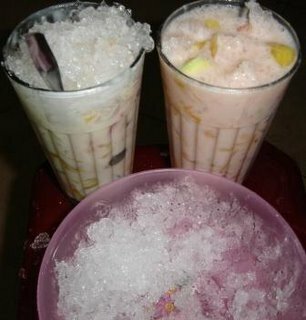 In Viet Nam, we use rice flour to make so many cakes such as Banh Xeo, Banh Canh, Banh Hoi, Banh Beo, Banh Cuon, Banh Trang... and Vietnamese people also use rice flour to make noodles and there are differences between the north and the south. 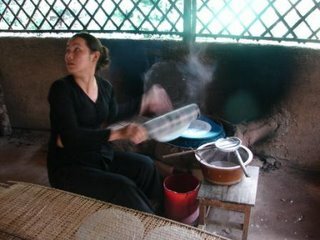 In the north, flat noodles are made, in the centre and the south, they are made thin and round sometimes in different colors. Back to steamed rice pan cakes. Actually, in the north they are called Banh Cuon. They are steamed then mince pork and mushroom is added, and they are rolled to look like spring rolls. 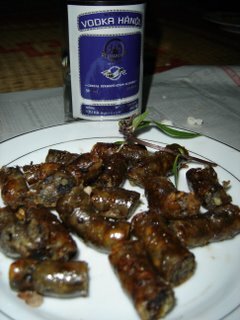 Dipped in fish sauce with dried onions, a bit of chili and some herbs, they taste delicious.In the south, they are known by the same name and follow the same process but they are made a little bit bigger. 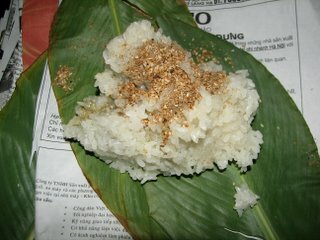 Another steamed rice pan cake is called Banh Trang, and there are quite alot of different kinds of Banh Trang. In the centre of Viet Nam, they make this cracker with some chili and coconut. 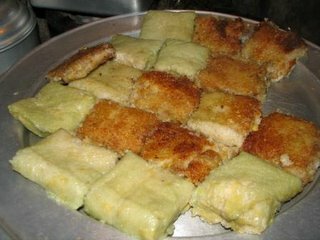 Some other places in the south also make this cake with milk or sugar but these cakes all can be eaten fresh or dried or grilled. You can eat them with beer, or dip them in shrimp sauce and drink wine or just as a snack. 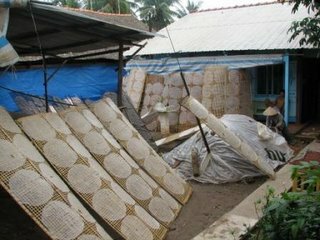 The producers of these crackers dry them in the sun on a bamboo frame and it takes about 30 mins before it is ready. 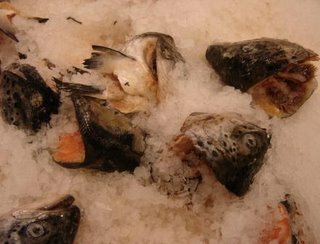 There are regional differences in the way they are cooked. Some places use the thin flat bamboo stick to pick the cake off the steamer after it's cooked, but other places use a round object like a bamboo stick or plastic tube to pick the cake off. If you are a vegetarian, you also can eat Banh Cuon but don't forget to ask for them without meat. These cakes cost no more than a few thousand dong. 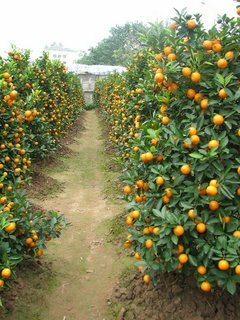 Today, my friends in Hanoi are going to Lang Son province for shopping. 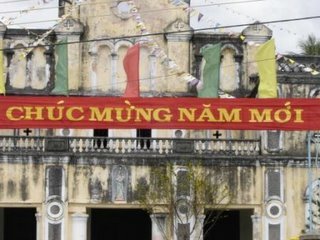 This province is on the border between Viet Nam and China. 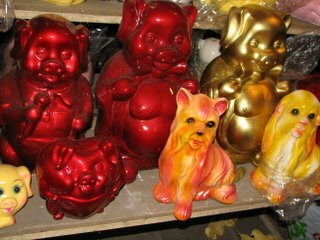 Things are imported from China under taxes. Most of the goods from there are much cheaper than in Hanoi, so many people from elsewhere in Viet Nam also go there to buy and then sell the products in their own retail shops. Quality is a problem with some stuff and of course nothing is guaranteed. There is the possibility of getting caught by the police if you buy more than one thing and of course you will have to pay lots of tax. 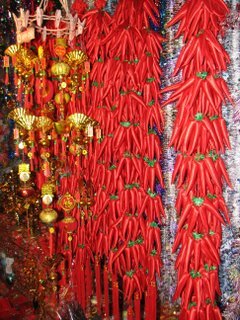 People say that this Lunar New Year seems to be coming earlier than usual, as there are lots of people hanging around shopping for new clothes and goods for Tet. 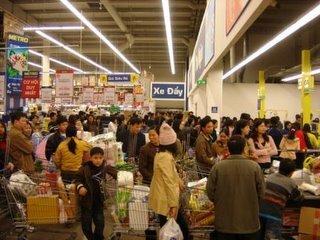 Everywhere -supermarkets, big and small markets are full of people, prices are being put up without notice, depending on the owner. 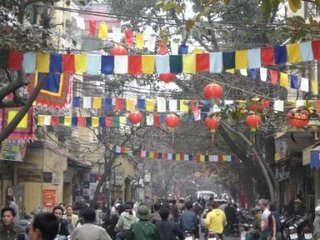 People are buying early because they're scared that the price will get higher as Tet approaches. For me, I always have to pay more than Hanoians because I have a southern accent. I got upset many times with the sellers because they always try to rip me off, which is really annoying. 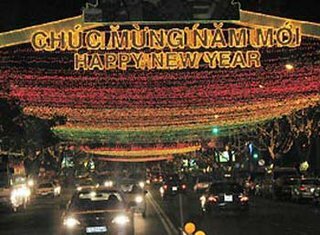 Following many requests, here is a post about typical Hanoi night life. 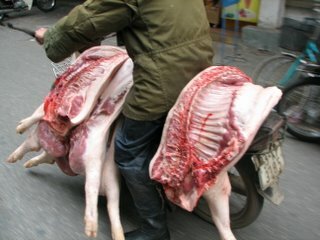 I have done some research and I think now is a good time to post about this part of Hanoi life. Even though, it's ice cold weather but a lot of activity is still happening, especially late at night. So many people dine out at Lau restaurants which are popular now, where a mix of adults and teenagers can hang around for a few hours which costs less than bars but they still can drink lots of ruou and get drunk. 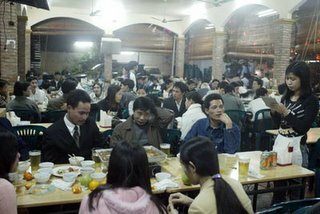 Most young people enjoy going to ruou dan toc(tradional wine) shops, where they sit on mats at low tables like in Japanese restaurants, drinking wine, eating grilled dried fish, cuttle fish, grilled Nem(sour pork mince wrapped in banana leaves) and rice crackers. 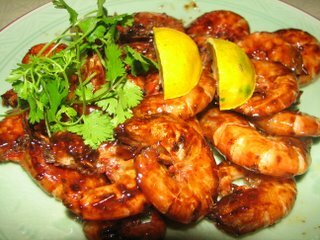 In Nha Trang, where I come from, we usually sit on the beach and drink wine or beer with fresh mango, guava or some other sour fruits and rice crackers dipped in Mam tom ot(shrimp sauce with chili) which tastes great. Another place where lots of teenagers go late at night is in the middle of Hang Bong Street where there are lots of small grilled Nem Chua shops. Before they come to these places, they usually drive around, eating a fruit treat called Hoa qua dam or drinking coffee at Truc Bach lake. I was talking to quite a few older people, and they said they like going out for a few glasses of rice wine or inviting friends over to their houses to drink but not too late because they prefer to wake up early for morning exercise than go to bed late. New Century Nightclub is also a common place for young people to go for fun. The funny thing is the way Hanoians dress up. While the men look like they're going to work, the girls are dressed up beautifully. I was asked by lots of my colleagues why I dress up like crazy when I go to the disco? I always wear jeans, or casual pants with disco shoes and I think these clothes are for disco or going out instead of wearing boring working clothes. Am I right? 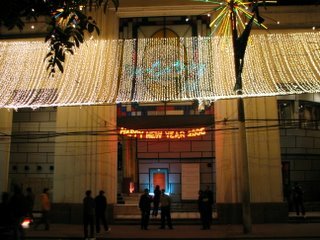 There are lots of nightlife options in Hanoi. 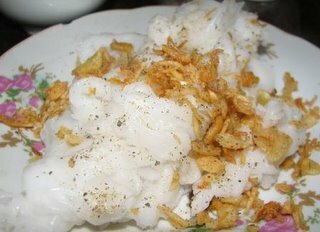 Fried Bánh Chưng (Square cake) is so popular now in Hanoi because of the cold and the fact that Tet (lunar New Year) is coming. You can see lots of shops along the street and many ladies hanging around with shoulders baskets, an iron tray on top of a cooker with lots of small square cakes. This is a bit heavy for a snack but it is my favorite. You should choose the over cooked ones - they are a bit crispy which is good. Add some Soya sauce, sweet chili sauce and some herbs - wow yummy. It's only 3000Vnd, and you don't need to bargain at all :) You also sit down in the shop or on the pavement and it costs exactly the same. This is a really delicious snack but it's not good for vegetarians because there's meat, pepper and beans in the middle of the cake, which is all covered from sticky rice. 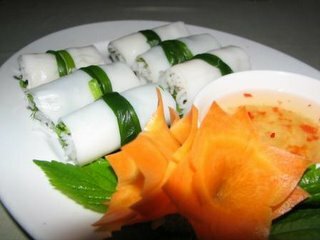 Fresh Spring rolls are the most common starter in Vietnamese restaurants in Viet Nam. 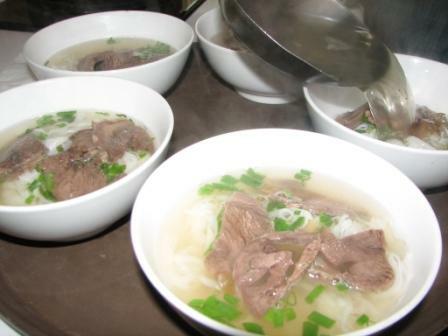 In Hanoi, there is an area aroung Truc Bach Lake which just sells rolls called Pho cuon. In response to requests from Vietgod readers, I am going to give you a recipe of this particular fresh spring roll and the its story. 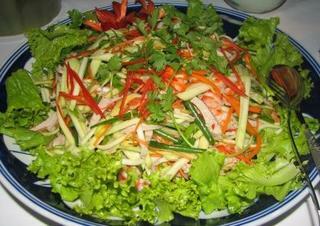 The following information and recipe is from Seasons of Hanoi, one of the restaurants in my group. The Nguyen dynasty came to power in Hue in 1802. What followed was a highly controversial period of rule as well as highly decedent lifestyles. 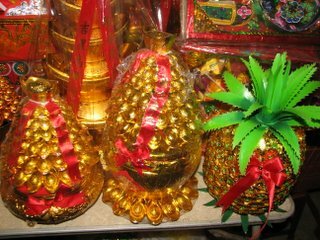 King Tu Duc was reported to call upon over 30 chefs to accompany him to the Royal tombs. The chefs practiced a style of cooking that placed great importance upon delicately crafted, ornamental dishes. 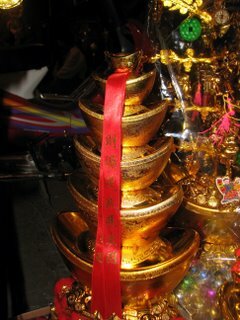 Hue is still famed for this style of food and uses rice paper to wrap light food parcel. 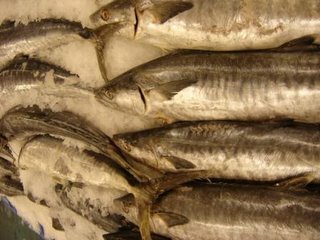 Cook the pork and prawns in boiling salted water. Slice the pork into thin strips and the prawns in half length ways. Take a piece of rice paper and place on a damp towel. Coat the rice paper with hot water using the fingers as a brush. Place three half prawns, and three thin slices of pork across the central section of the rice paper approximately 1/3 of the way from the bottle. 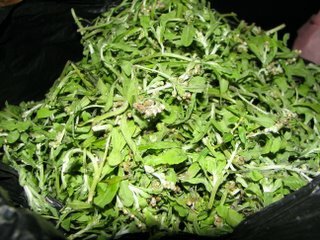 Add a small amount of blanched bean sprout, grated carrot, fresh vermicelli, lettuce and mint leaves and rolls the parcel. 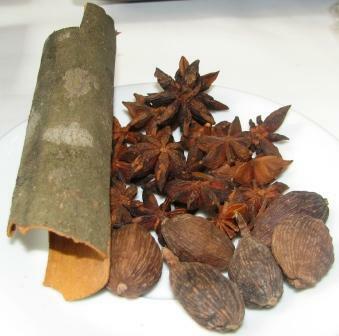 The mix of ingredients should be uniformly dispersed and spread over 8- 10 CMS. Folding in the rice paper and to the side of the ingredients as you roll up the parcels. Dipping sauce: Lemon: squeeze for juice. 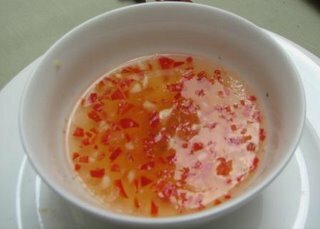 Put fish sauce, sugar, lemon juice, garlic chili in a large mixing bowl; put 2 spoon of fresh water in then stir well. It is important to apply a little pressure as you roll to ensure that the roll is firm & tight. Hope you guys enjoy this dish yourself at home and get back to me. We went to Metro to buy some wine for my good friends wedding. This is a huge supermarket where people go on the weekend to buy lots of things. The Metro is far away from the city centre, on the way to the airport and most people go there by car or motorbike. 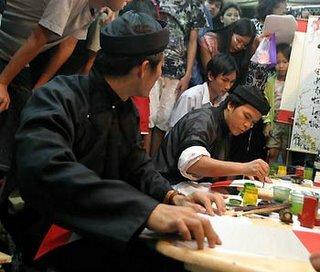 You need to be a member to get in, though it seems that everyone in Hanoi is a member! I would suggest that you don't go to this place on the weekend because you will have to wait for hours in the check out queue. In general, things are a little cheaper than in the city stores but there are also heaps of things that are much more expensive. People think that this is a good place to go but I don't think so for several reasons. The staff are not helpul, preferring to talk to each other rather than answer customer questions. 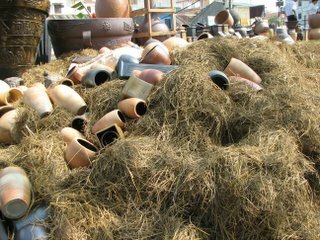 Much of the stock is not in a good condition. There seem to be so many staff hanging around doing nothing, but if you walk near the cashier or right behind there, there are dozens of items that people don't want which are left lying around. No one appears to care about that, even though it may be fish or meat. I don't know why the management doesn't do something? Is doesn't seem like a very profitable way to keep the food and run the business? It is definitely a busy place with a wide range of things but it is a long way from the city and takes too long to get out.